← Does smiling cause happiness? 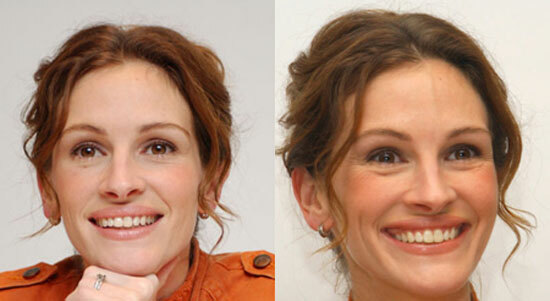 Which Julia Roberts smile is the “real” smile or as it’s known in scientific circles, The Duchenne Smile? Smile #1 or Smile #2? Looking at smiles every day, I began to wonder how easy is it to spot which smiles are genuine and which are fake? Scientist now tell us that genuine, or Duchenne smiles, can be faked. I guess we have to pay attention to determine when someone is faking a smile. And guess what? We also have to pay attention to when a smile means something more than we might expect! If someone is smiling, it means they’re happy, right? Well, not always. Sometimes people smile to be polite, or because they want to “appear” happy or friendly for social reasons. While smiling is perceived as a positive emotion most of the time, there are many cultures that perceive smiling as a negative expression and consider it unwelcoming. Too much smiling can be viewed as a sign of shallowness or dishonesty in some cultures. Japanese people may smile when they are confused or angry. In other parts of Asia, people may smile when they are embarrassed. Some people may smile at others to indicate a friendly greeting. A smile may be reserved for close friends and family members. In Southeast Asian and Indian cultures, a smile is frequently used to cover pain or embarrassment. Many people in the former Soviet Union consider smiling at strangers in public to be unusual and even suspicious behavior. Yet many Americans smile freely at strangers in public places (although this is less common in big cities). Who knew that the language of smiles could be so complex?